If you’ve booked to stay at one of our luxury holiday cottages over the next few months be sure to include a visit to the wonderful Chatsworth House on your itinerary. As we edge ever closer towards Spring, there’s plenty happening at the lavish stately home and grounds. From now until 9th March Chatsworth House will be hosting the Peak District Artisans exhibition, offering a wealth of artistic diversity, from digital landscapes to ceramics. Established in 1991, Peak District Artisans is a highly successful association of some of the very best professional artists, makers and artisans based in and around the Peak District. This exhibition promises to have something for all tastes. For more details about this free event, visit the Chatsworth House website here. Immerse yourself in Chatsworth’s rich and fascinating history with these informative talks. With just one date remaining on 23rd February, you’ll need to be quick to get your tickets for this popular event. Delve into the past and enjoy a fascinating talk with stories on the lives of the servants and estate community at Chatsworth, exploring three centuries of change, from 1700 to 1950. The talk will be followed by refreshments in the picturesque Cavendish restaurant. To book and discover more about Chatsworth House, click here. Another popular talk not to miss! Lord Burlington discusses the vision and values of the vibrant community at the heart of Chatsworth. Plus, learn a little bit more about the other Devonshire estates. The 105-acre garden at Chatsworth is famous for exquisite landscaping and a beautiful array of different trees, flowers and shrubs. Hear from Chatsworth’s horticultural experts and learn about how it’s evolved over five centuries. To book, visit the Chatsworth House website here. This talk explores modern farming and forestry at Chatsworth with Farm manager, David Howlett and Head forester, John Everitt. Refreshments in the Cavendish restaurant are included. Hear the Duke and Duchess talk about some of the hidden gems around the Chatsworth Estate and their favourite places further afield. For more information, visit the Chatsworth House website here. 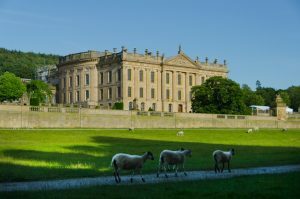 If you’d prefer to get out and discover the stunning grounds of Chatsworth and surrounding villages, then the guided walks are for you. Learn about how the landscape has evolved and take in some of the best views Chatsworth has to offer. Depending on how far you want to walk and how much you want to see, there is a short park walk, taking approximately two hours, and a long park walk, taking approximately four hours. From the season opening, on 24th March, onwards, the house, garden, farmyard and playground will host a range of events for all the family to enjoy. Take a look at some of the highlights below, and keep an eye on the Chatsworth House website for full details of all the activities. From 11th to 13th May Chatsworth will host the International Horse Trials. Enjoy world-class competition, from elegant dressage and exciting show jumping to gripping cross country. Aside from the equestrian sport, there’s a range of entertainment and activities for the whole family. Browse the shopping village with over 100 high-quality trade stands or watch the dog show! This event is sure to be highly popular, don’t miss out! Book and enjoy up to 50% off day tickets until 31st January! If one or more of these fantastic events at Chatsworth House have caught your eye, contact us today to find out about our current availability. Located in the heart of the Peak District, our luxury holiday cottages are suitable for couples, families and large groups, and we’re dog-friendly!